Last night I made some changes to my mouse; we’ll see if they’re improvements or not. Originally I was dismantling it to clean it. Something had gotten inside the wheel and was causing it to scroll inconsistently. Once I got inside, though, I saw an opportunity to tune it. First was the clicking on the wheel. This is accomplished with a spring, and is sometimes annoying, especially since I like to give my scroll wheel big long spins to quickly move around on a page. Removing the spring was pretty easy. Second, I noticed a weight added to the inside. I’m not entirely sure what the weight accomplishes, other than making the mouse that much harder to move, so I took it out, too. 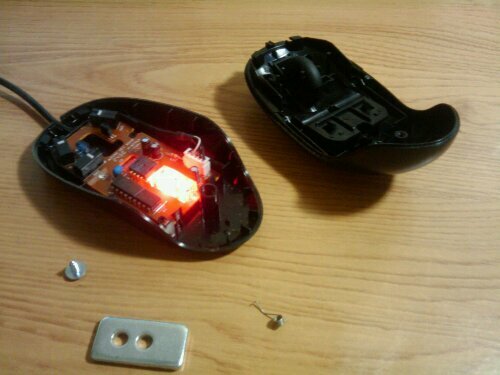 If I need, I can easily put the parts back in, but at the moment I’m rocking a lighter, smoother mouse.